13 May 2012: Since the Sunbox was built, the curve of ground temperature has been nicely smoothed, but in the recent two months, we have had two influences on the curve, causing it to flatline at 11ºC for several weeks. One, the Sunbox and its meter was out of action from the middle of March until very recently. Two, the weather got colder causing more heat withdrawal and less heat insertion. Now that things are working again and the weather is improving, the curve is also recovering. 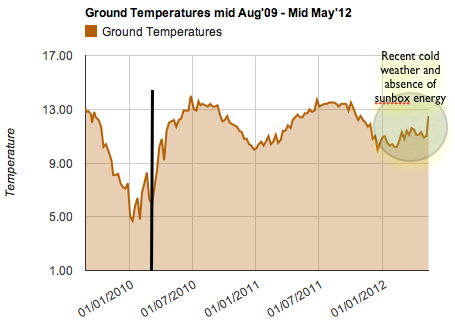 One can see from the entry of today that the ground temperature shot up to 12.5ºC, a significant recovery.